Beethoven Piano Trio in Bb-Major, op.97 "Archduke"
Three voices, one sound: The kind of pitch-perfect unanimity of phrasing, tone, feeling and interpretation that distinguishes the finest chamber ensembles. Pianist Thomas Hoppe, violinist Annette von Hehn and cellist Stefan Heinemeyer have been conquering the world's major concert series together since 2003. 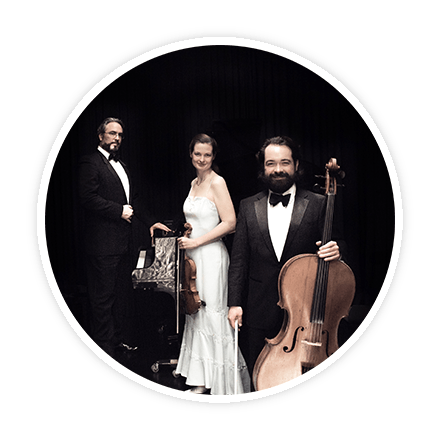 Around the globe, the ATOS Trio is hailed by audiences and met with critical acclaim. From winning the Kalichstein-Laredo-Robinson International Trio Award, the gold-standard prize for trios in the US, to a prestigious recognition as "New Generation Artists" by the BBC. From prizes in London, Graz and Melbourne to concerts in all the major festivals and venues from Oceana to Carnegie Hall. The ATOS Trio pushes expression and dynamics to the limits, and with its incredibly distinctive warm expressive unified trio sound, far beyond the comfortable, familiar, and expected. "They were Austrians in Haydn, Czechs in Dvorak, and Russians in Shostakovich." On enthusiastically received CD recordings of classical and romantic repertoire (Beethoven, Brahms, Schubert, Schumann, Mendelssohn); in complete premiere recordings of Heinrich von Herzogenberg and Josef Suk; and most recently in a celebration of French, Russian and Czech music (The French album, The Russian Album, The Czech Album). Their total dedication to the music, the joy, the almost magically differentiated interpretation sets new standards. "... One of the elite Piano Trios playing before the public today." "Atos has risen steadily through the ranks to become one of the elite piano trios before the public today. The Atos Trio's perfect harmony yields master pieces." "What marks out the three trio members is the validity of a musical relationship that starts off with a thorough awareness of their interdependence"
"From the beginning it was plain that this was a unified ensemble, not just three gifted soloists. The playing was brilliant and emotive by turns"
"Most distinctive was the group's use of dynamics. Rarely does an ensemble derive so much meaning and feeling out of sheer fluctuations in volume. Moreover, the players espoused pristinely clear articulation, relating the music's every detail." "Technical Mastery, polished interpretations and a deep sense of teamwork put them into a league all their own"
"The sound of the ATOS Trio was silky smooth. All the instruments were nicely integrated each contributing fully yet equally which resulted in such a pleasurable experience for the listener."